Welcome to March here at The Dark Jane Austen Book Club! I certainly hope that it has been lamblike and docile for you, dear readers. Or perhaps, you prefer March to roar in like a lion. Full of noise and gusty winds. But whichever you prefer, like every month, our newest book selection both roars like a lion and is as innocent as a lamb. I’m sure you are all smart enough to know who did the roaring! For this month, we will be reading The Disappearance of Georgiana Darcy: A Pride and Prejudice Mystery by Regina Jeffers. The book begins after Jeffers novel A Christmas at Pemberly (if not, it references those events A LOT, but I have not read the Christmas novel and was just fine reading this book), and we meet the Darcys, the Bennets, the Bingleys, and yes, the ever tiresome Wickhams on the joyous occasion of Kitty’s wedding. And what’s a family gathering without a little drama, temper tantrums, and feuding? As Wickham threatens Darcy and Darcy lets his pride win, Elizabeth must intervene to keep the peace so poor Kitty can have her special day. But there is a family member who is noticeably missing from Kitty’s wedding. Georgiana, herself newly married, rashly decides to go to her husband’s Scotland estate to await his arrival home from the Battle of Waterloo. But when she receives a post that her dearest love is dead, she blindly confronts the terrors of the Scottish countryside, the moor, its ghosts and goblins. Because it wouldn’t be a good Scottish landscape without a spooky, Medieval castle and dungeon. Forced the confront her fears, will Georgiana survive her ordeal? Will she ever learn the fate of her husband? 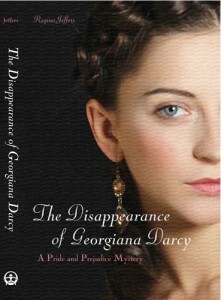 Of course, if you want to know, you will have to join us in the discussion of The Disappearance of Georgiana Darcy!